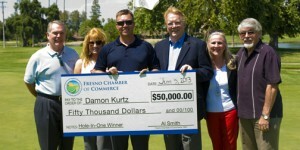 FRESNO – Damon Kurtz, first vice president of the Fresno Police Officers Association, is $50,000 richer after sinking a hole-in-one shot during last month’s Fresno Chamber of Commerce’s Annual Chamber Golf Tournament at the San Joaquin Country Club. 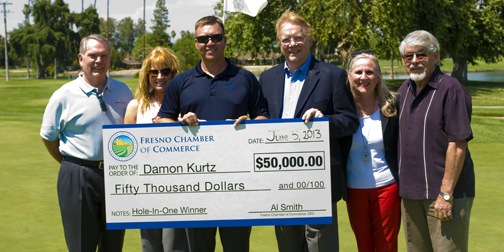 Kurtz was presented with his check Wednesday afternoon from Fresno Chamber President and CEO Al Smith at the very hole where he accomplished the unexpected. Kurtz said when he made the shot he was unsure of its quality at first, and still seems almost at a loss for words, especially considering he is not a serious golfer. 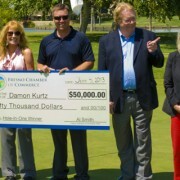 Fresno Chamber of Commerce President Chamber of Commerce President and CEO presents an oversized check in the amount of $50,000 to Damon Kurtz (center) along with his wife, Michelle Kurtz. The are joined by Chamber board of directors Rick Whitsell, Patty Hixson and Al Solis at Hole 7 of the San Joaquin Country Club, where Kurtz sunk a hole-in-one at the Annual Chamber Golf Tournament last month. “I am recreational at best,” he said of his skills on the links. Smith said this marked the sixth year of the golf tournament, and the first time cash prizes have been incorporated into the event. One hole-in-one shot was worth the $50,000, two offered $25,000 apiece, and a new Lexus was also up for grabs. “Damon just surprised everybody by hitting that hole-in-one out here, and you could hear the screaming,” Smith said. Kurtz and his wife, Michelle, are still unsure of what they will do with all the money, but there is talk of them taking a nice vacation. “At this point just trying to be smart with it, pay some bills,” Kurtz said.